Reimagined luxurious hotel rooms in Savannah, GA that offer the best of both worlds. 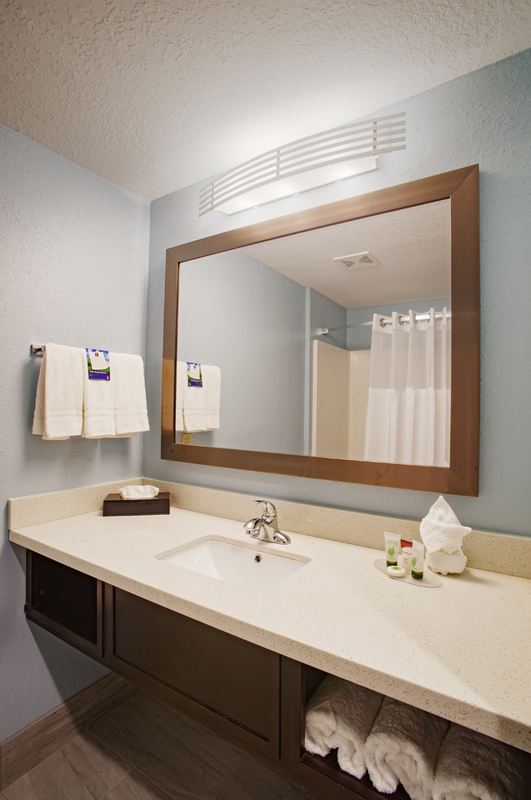 Sleek, elegant rooms with extra space and carefully chosen design, paired with affordable rates! Our rooms have a variety of views to choose from, with sprawling, lush garden views available. Find timeless Georgia luxury in our Savannah accommodations. Our hotel rooms in Savannah, GA offer the very best of Southern hospitality. We show our appreciation with extra little perks like freshly baked cookies served in our lobby every evening! And in the morning, stop by our free breakfast to start off your day in Savannah with something delicious. Breakfast is served on the ground floor and boasts a serene patio to relax on while you satiate. During your stay, you will also love taking advantage of our on-site pool, fitness center, laundry facilities, and more! 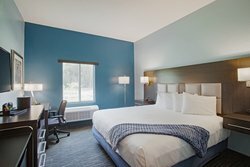 On top of fantastic amenities and a wealth of complimentary services, a stay in our hotel rooms in Savannah, GA is complemented by our dedicated staff. Our 24-hour front desk service is always on hand to provide you with help or point you in the right direction for all of the best things to do in Savannah! Explore pristine parks on a horse-drawn carriage, visit the birthplace of Juliette Low, explore a world of historic architecture, or take an Old Town Trolley Tour with ease from the comfort of our hotel rooms in Savannah, GA.
Book your stay today and start your Savannah adventure tomorrow! 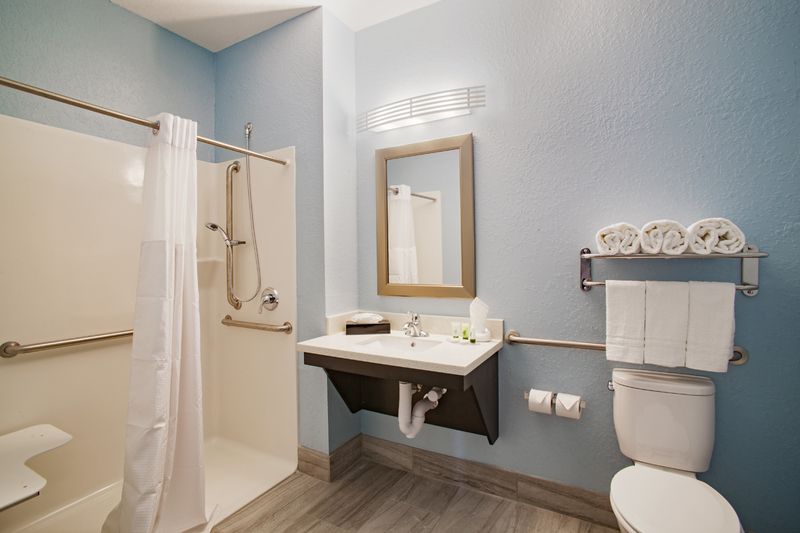 Discover fantastically refreshing relaxation in an ADA accessible room with a pillow-top king bed. Located just outside the downtown Savannah area, this room is a getaway for affordable luxury. Direct access to the included private pool and guest office space. We are a non-smoking facility that welcomes you to bring your pets along for the journey. To ensure your stay is seamless, we have accessible parking spots just outside our door and the room is built in accordance with the ADA accessibility guidelines. This room is also available with a visual and audible alarm with a doorbell for the hearing and sight impaired. 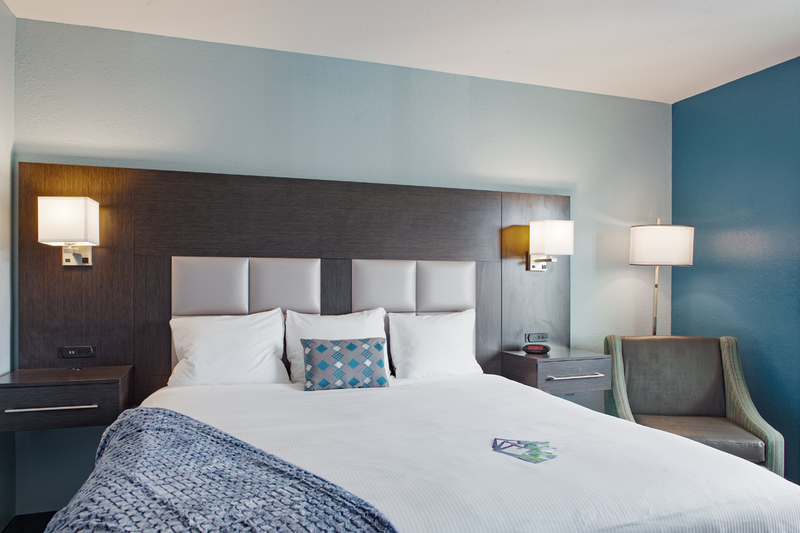 Discover the fantastically refreshing relaxation of one of our pillow top king beds. Located just outside the downtown Savannah area makes us the best stop for affordable luxurious visiting. Direct access to the included private pool and guest office space. We are a non-smoking facility that welcomes you to bring your pets along for the journey. This room is also available with communication devices for the hearing and sight impaired. Rest and relaxation await in our standard double room, with super-comfortable double mattresses and lots of space for groups of four people. Discover your own slice of Garden City, close to downtown Savannah. Kick back and relax in front of a large-screen TV, or sit down and focus on work with high-speed Wi-Fi and in-room desk and workspace.